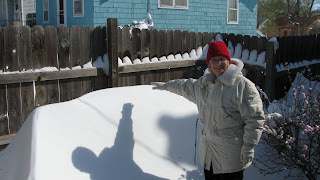 Elsie M. Campbell and Aunt Mimi's Quiltworks: The BIG Snow! My friend Ruth and I spent all day yesterday in the sewing studio upstairs. It was snowing, snowing, snowing and blowing all the snow around. We were comfortable and warm, and busy working on our projects. I introduced Ruth to my Bernina 200/730 and all the great things it can do with embroidery. She added some pizazz to some capris with embroidery and hot-fix crystals in anticipation of getting out of Dodge next week to warmer climes. I worked on a quilt top that will eventually be Ruth's, part of our barter agreement for all her hard work on my website. Sally the Cat napped in her warm place on a bath towel I put on the floor for her. Ken, the husband and happy-for-a-snow-day (finally!) teacher, napped in his warm bed in the room opposite our beehive of activity. All were happy and cozy! 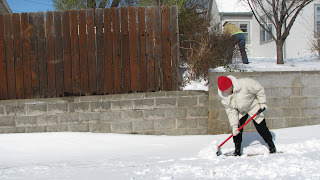 Today, we had to prevent cabin fever by going out to survey the neighborhood with four-foot-deep drifts of snow, cars stranded on the side streets, and people digging out from the major blizzard. After a couple of stops at grocery stores for necessities like basil, mozarella, and tomatoes for a special treat for tonight's dinner, we arrived home in time to get our sidewalks shoveled so the mailman could find our house. But to no avail! No mail yesterday or today, because all the highways into and out of Dodge City were closed due to the blizzard conditions. Yard work is on hold and since we needed the moisture any way we could get it, this snow event has created a time to slow down and celebrate this late-season snow. Don't you love Snow Days? Or at least days when you have an unexpected break in your busy schedule? Do you take advantage of times like this to give yourself the gift of time to play? Why wait for a Snow Day? It is rejuvenating to take a day off from routine, scheduled or unscheduled, for renewing your creative spirit. Finish a project that has been languishing on that shelf at the back of your studio. Or start a new project that you've put off for one reason or another. Declare 'pajama day', if you want. Fix yourself a cup of cocoa and put your feet up while taking a few stitches on that special handwork project. Be your own very best friend, and take a little time to treat yourself like a special guest.